• Audio Commentary with Frank Capra Jr. 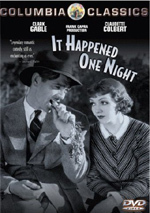 Call it reverse deja vu - that's what I experienced with 1934’s It Happened One Night. I felt as though I'd seen the film, even though that wasn't the case. However, this pioneering effort has been imitated so many times over the decades that what was an original picture seems derivative. See 1999's Runaway Bride one recent hit incarnation of the film's plot. Of course, I can't call Night derivative because it apparently wasn't. I wasn't around back then to know, but all accounts indicate that it was a fresh and original piece of work. Just because it broke new ground doesn't mean it stands up over time. Plenty of seminal works look poor in later years. That doesn't seem to be the case with Night; though it shows its age - particularly in the handling of women and various semi-political issues - the movie still appears pleasant and entertaining. The acting seems uniformly strong, as one would expect from a film for which both lead actors - Claudette Colbert and Clark Gable - won Academy Awards. I found Colbert's work to appear especially good, as she showed a tremendously wide - but appropriate - range of emotions and displayed believable growth in her character. Gable also is very good, but he doesn't seem quite as strong as Colbert. Much of that may be due to the constrictions of the part, since I doubt they would allow a "tough guy" character to demonstrate similar emotional range. In any case, both actors are tremendously winning and effective in their roles. Night suffers from some very significant plot holes but still seems charming and amusing. I don't know if it really deserves its status as a classic, but it remains a solid film after all these years. It Happened One Night appears in an aspect ratio of 1.33:1 on this single-sided, double-layered DVD; due to those dimensions, the image has not been enhanced for 16X9 televisions. While not a bad transfer, the movie suffered from some concerns. The majority of these related to source flaws. Various examples of specks, marks, lines and other defects popped up frequently through the movie. These weren’t overwhelming, but they provided a constant issue through the flick. Sharpness usually looked good. Some softness seemed to result from the style of photography; Capra appeared especially fond of spotlighting Colbert with some mild "glamour shot" lighting. Otherwise, the movie mostly boasted good clarity and definition. Though a little edge enhancement occurred, I noticed no issues with shimmering or jagged edges. Black levels seemed reasonably dark and tight, though they occasionally appeared a little grayish. Shadows also were slightly erratic. While most low-light shots seemed fine, a few appeared somewhat too dark. The print flaws were the primary issue here, and they dropped my grade to a “C“. A pleasant surprise came from the monaural audio of It Happened One Night. The film came out during the relative infancy of sound movies and I expected it to sound harsh and scratchy. However, it's actually a very clean and accurate soundtrack. Distortion - which plagued more old mixes than anything else - was virtually nonexistent, even when characters shouted. Night offers a few supplemental features. We start with a running, screen-specific audio commentary from Frank Capra, Jr. The director’s son covers the project’s genesis and development, cast, characters and performances, and various production elements. The commentary begins well as Capra goes over the movie’s origins and related issues. However, he soon peters out and offers only sporadic notes throughout most of the film. Occasionally he’ll toss out decent remarks about his father’s use of rain in his flicks or the movie’s reception, but much of the time he either remains silent or simply describes the action on screen. This is a pretty dull commentary without much to keep us going through its 105 minutes. We hear more from Capra in an 11-minute and 14-second piece called Frank Capra Jr. Remembers...It Happened One Night. This program intercuts interview shots of Capra with scenes from the film and other photos as he talks about the movie. He discusses the project’s origins and development, cast, characters and performances, sets, the tight schedule and related challenges, and the flick’s success. Some of the information from the commentary also appears here. Really, the show is how they should have presented the commentary; simply make it into a documentary like this, since it would have compacted Capra’s narration into a much more listenable package. "Remembers" isn't a great program, but if provides some useful information. Also delightful are the period ads from sponsor Lux soap. Apparently if I wash my underwear before I don it, I will be more popular. So that's why I've had such a weak social life! Where do I get me some of that Lux? In addition, we encounter a Vintage Advertising section on the DVD that offers a mixture of lobby cards and theatre posters for the film; it provides 12 stills in all. The disc features the original theatrical trailer for Night as well as ads for fellow Capra flicks Mr. Smith Goes to Washington and Lost Horizon. We also get the usual basic and useless CTS Talent Files for Capra, Gable and Colbert. Finally, the DVD offers a booklet with brief but informative production notes. As far as a recommendation goes, It Happened One Night gets a positive call, though not an enthusiastic one. I liked the film, though it didn't bowl me over, and the DVD provides decent picture, relatively good sound, and some passable supplements. It's not a fantastic DVD, but it seems strong enough to warrant viewing.